In the Species and Spaces project, we’re exploring people’s perceptions around fish use, sentience, and how these shape and define assumptions around their welfare requirements. 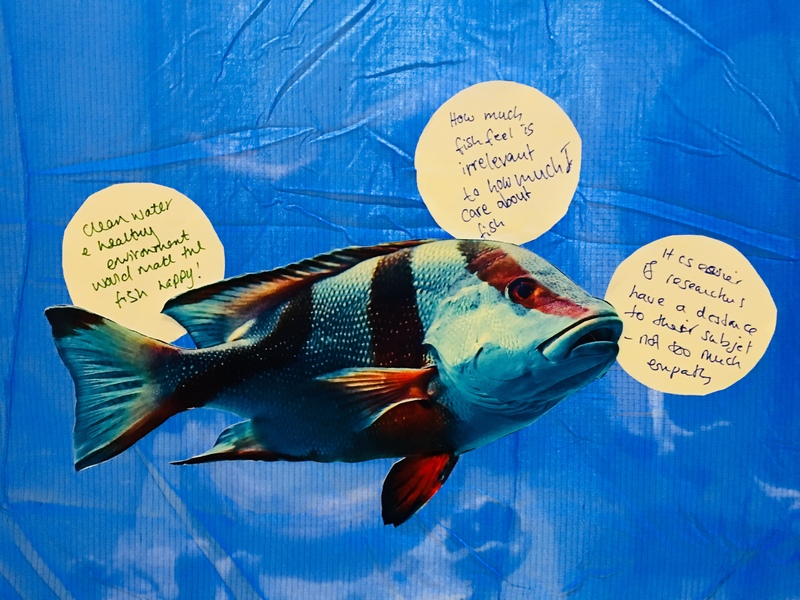 We wanted to see what the public thought about our research and, in a broader sense, how they felt about fish. 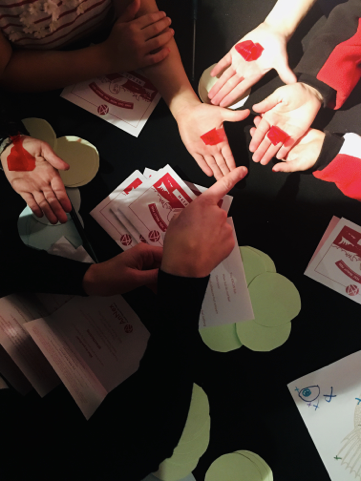 Psychic fish are bringing a nexus approach to public engagement, offering participants new ways of reflecting and dissecting their own thoughts, assumptions, obligations, and sensibilities. In our first public engagement activity, we created a “liquid zoo in a dead zoo” and asked passersby two short unexpected questions, from the perspective of a fish: "What Makes Me Happy?" and "How would You Know?" Most participants had, understandably, never thought about what makes a fish “happy”, and we discovered that it can be difficult to get people to think about the cognitive and emotional capacities of fish. Perhaps these questions were too big and nebulous. What we needed was a hook! We wanted to catch people’s imagination and gently guide their thinking from the open ocean to the lake, the plate, and the lab. It would need to be creative enough to feel driven by curiosity and discovery while also establishing a sense of reciprocity. We wanted participants to explore their own feelings and challenge themselves by asking more questions about our research and approach. We hacked the classic cracker game to make it less introspective and more empathetic. These psychic fish revealed to participants their “true” feelings about fish. For example, the psychic fish revealed to some participants that they believe fish are fully sentient beings, while others discovered that they believe fish feel nothing. For others, the psychic fish revealed that they think fish are delicious (a result that was rarely disputed). By psychically telling participants how they felt about fish, we offered an opportunity for people to explain why they felt that way (or, as often happened, correct the fish for a false reading). This proved a great way of starting conversations. 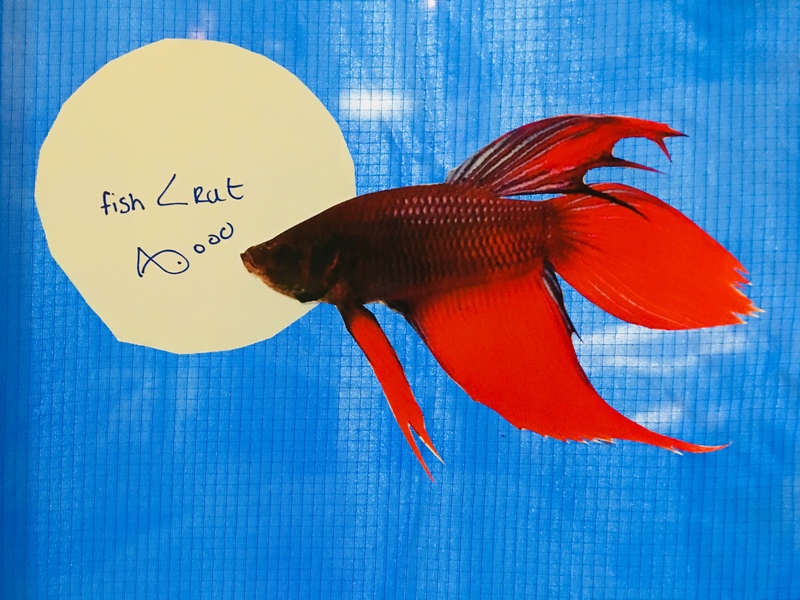 Psychic fish was first trialled at Oxford’s Community Fare, where it started conversations about people's personal experiences with fish. We heard about how it felt to catch, kill, and eat a trout with a grandchild. We heard about being told a pet fish died from lack of attention. We heard about how people try not to think about animal research. One participant even told us about how a German friend was writing a book about Heathrow Airport’s fish tank! Over the next few months the psychic fish made several more appearances, including Science Uncovered at Manchester Musuem as part of European Researchers' Night, and Platforms of Investigation as part of Manchester Science Festival at the Science and Industry Museum. At these events we added two other elements to facilitate conversations and share ideas: Plotting Care and Fishy Thoughts. 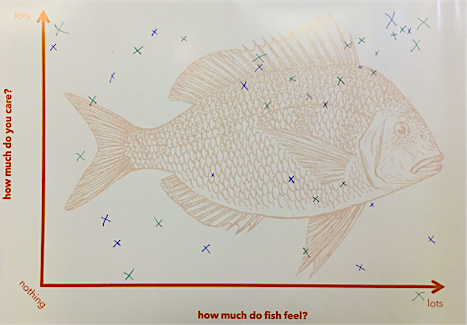 Participants plotted how much they cared about fish against how much they thought fish could feel. This was not designed to be quantitative but to facilitate a conversation around somatic empathy, whether you need to care about something to take care of it, and the implications these factors have on welfare and care within the laboratory. In this respect the activity worked well even with younger children. The unexpected joy of this was how much discussion is produced in family groups. Often people would be shocked at someone else’s feelings. This suggested that we created an activity that supported people answering truthfully and not how they thought they should. We created a sticky wall decorated with pictures of fish. Participants were invited to take a thought bubble and add it to the wall. The freedom of the wall acted as an open (visual) question and allowed people to share more on their own terms. The walls elicited diverse and fascinating responses ranging from the deeply personal to wildly abstract. You can explore more of responses in the event evaluation reports, which can be downloaded below. 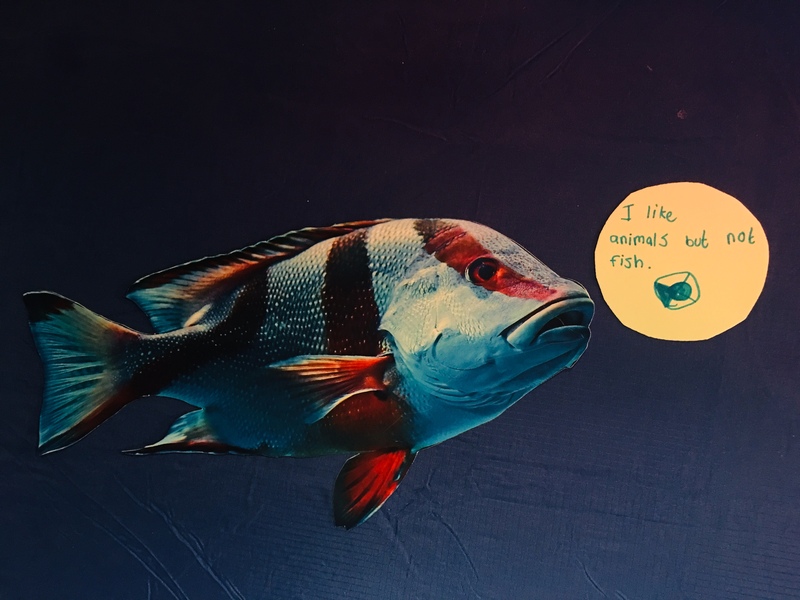 The original aim was to explore people’s perceptions around fish use, sentience, and how these ideas shape and define assumptions around species welfare requirements. It was important to create a space free from judgement or authority where participants were free to choose their level of engagement, share personal beliefs, confront difficult issues, and leave feeling respected and stimulated. The conversations sparked by the psychic fish emerged organically and followed many different paths to many different destinations. In this sense the psychic fish are bringing a nexus approach to public engagement. They allow multiple viewpoints from a range of disciplines to be considered equally, offering participants new ways of reflecting and dissecting their own thoughts, assumptions, obligations, and sensibilities. Since these arose freely and were openly shared we know we are on the right track. We'll keep thinking with the fishies to further develop these engagement tools and our practice. If you would like the psychic fish to visit you, please get in touch with Bentley.